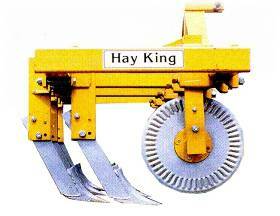 University tests show greater yields using the Hay King Renovator than from substantial fertilizer application without renovating. · Rugged, 4-inch heavy tubular frame and 3-point hitch with rear drawbar hitch for trailer. · Coulter blades vertically adjust to allow clean-cut slice through roots. · Unique ripping foot designed to penetrate below coulter and cut approximately 5½ inch average depth with a draft and lifting action of the sod and with minimum surface disturbance. · Lateral adjustment of both coulters and shanks allow spacing from 13 to 30 inches. · Alternating staggered shanks 8 inches forward and back allows closer (13 inch) spacing of shanks without pulling up patches of sod and allows the leading shank to move sod slightly over in one direction and the “following” shank to move it in opposite directions creating a thorough renovation.